The White Fox by James Bartholomeusz. Review: Have you ever been out of this universe to a different planet and had to learn alchemy? Jack Lawson has this experience with his friend, Lucy. When the Cult of Dionysus, the people of dark alchemy, attacks Earth in search for the Door of Darkness, tragedy strikes the town of Birchford. Jack and Lucy flee Earth to go to the planet of Rauthr. After weeks of combat and alchemy training, Jack and Lucy meet up with the Cult once again. 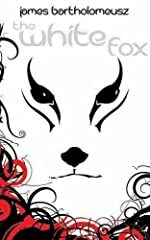 In this stand-alone book, The White Fox by James Bartholomeusz, will Jack survive? Jack and Lucy barely survive on Earth. While traveling to Rauthr, a white fox follows him. Upon arriving there, Jack and Lucy meet elves and dwarves. They look for the leader of the Apollonians, Sardar, who guides the people of light alchemy. Jack and Lucy go through weeks of combat and alchemy training to prepare for battle. The Cult of Dionysus appears unexpectedly and battle takes place. I rate this book a five out of five. The White Fox is very suspenseful, keeping me on the edge of my seat almost every second. I found it difficult to put the book down. "The beast's body fell into the heart of the volcano and its spirit was fused with the mountain itself." is an example of how the author's writing kept me captivated. The story is also OUTSTANDING. The various planets, creatures and state of involving alchemy are very interesting to me. I like how the author uses his imagination to create this extraordinary story. I would recommend this book to a friend, but only with a high reading level. There are a few words that I stumbled on, but managed to understand. The author should make a series of this story. There are no downsides to this book, being one of the best I have ever read. In my opinion, The White Fox should win many awards. A good story lies within this book. It was very enjoyable to read and I will read it again. We would like to thank Medallion Press for providing a copy of The White Fox for this review. Have you read The White Fox? How would you rate it?